The Mattie Kenny era got underway in a somewhat muted fashion on Tuesday night, as Dublin beat Carlow 2-21 to 1-16. The Galway native enjoyed huge success with Cuala in recent years, winning back-to-back All-Ireland titles and when the county job arose following Pat Gilroy’s departure, he proved a popular replacement. With no Ballyboden representatives following their Leinster final loss to Ballyhale Shamrocks and game-time being managed for other senior members of the panel, this was a chance for many to impress the new manager. There were signs that Kenny is looking to already leave his stamp on the side with shades of Cuala’s style as a running game in the middle third looked to tear through the Carlow defence, and they sent low diagonal balls into the full-forward line when there was open space in front. John Hetherton of St Vincent’s assumed free-taking duties in the first half, and was accurate in tricky conditions as his five points helped the Dubs into a two-point lead at half-time. A goal from the lively Eamonn Dillon was the highlight for the Sky Blues before the break. 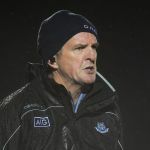 While Carlow rallied early in the second half with a Ted Joyce goal and took the lead shortly afterwards, Dublin moved up a gear with Burke and Hetherton striking points from play before Fintan McGibb scored his side’s second goal to put seven between the teams, and from there the Sky Blues kicked on. In all, there were positive signs for the Dubs as Kenny looks to further put his stamp on procedures in the coming weeks. Subs: Caolan Conway for Conor Burke (32), Ronan Hayes for Jake Malone (45), Conor Ryan for Sean Treacy (52), Oisín O’Rourke for Eamonn Dillon (64), Diarmuid O’Flynn for John Hetherton (66), Ronan Smith for Fintan McGibb (66), Daire Gray for Donal Burke (66). Scorers: John Hetherton 0-10 (0-07 frees, 0-01 ’65), Donal Burke 0-04 (0-01 free), Fintan McGibb 1-02, Eamonn Dillon 1-01, Caolan Conway 0-02, Sean Treacy 0-01, Sean Moran 0-01 (0-01 free). CARLOW: 1 Brian Treacy, 2 Alan Corcoran, 3 Paul Doyle, 4 Michael Doyle, 5 Eoin Nolan, 6 David English, 7 Richard Coady, 8 Jack Kavanagh, 9 Diarmuid Byrne, 26 Sean Whelan, 11 Ross Smithers, 12 Jack Murphy, 13 Martin Kavanagh, 14 Ted Joyce, 15 Chris Nolan. Scorers: Martin Kavanagh 0-12 (0-10 frees), Ted Joyce 1-00, Richard Coady 0-01, Jack Murphy 0-01, Chris Nolan 0-01, Jon Nolan 0-01.
Who do you think will win the World Darts Championship?